The French Connection: Even Better Now! Ever gone back to any film, book, or other creative work that completely defined a moment in your life and found that it didn’t come close to passing the test of time? Sometimes the life moment is so distant and the book or film is so tied to that moment that you simply can’t remember why you felt the way you did. I’ll never forget going back decades later to the novels of my high school favorite Somerset Maugham and being stunned at just how bad – well, how mediocre – his prose was. And then there is a film like The Graduate, such a perfect take on my coming of age (everything: the schools, the SoCal lifestyle, my emotions) that I find it even more powerful today. For heaven’s sakes, I even had an Elaine, but no Mrs. Robinson! My single most disappointing second go-round with a film was when I watched William Dieterle’s Portrait of Jenny several years ago. What had been mystical and impossibly romantic in my mid-teens had “turned” to clap-trap. Which leads to William Friedkin’s The French Connection. Just saw it for the first time in 30 years. Still stunning. Still gritty. Still thrilling. And still one of the greatest examples ever of how a handheld camera in the pre- steadicam era could take you on an almost unbearably riveting journey. 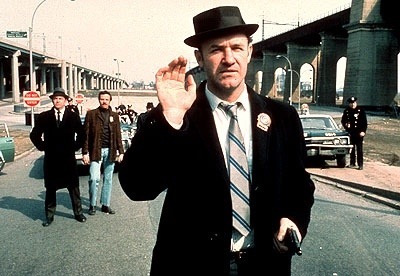 Al Maysles (Salesman) and Haskell Wexler (Medium Cool) were such influential and important players when it came to handheld, and The French Connection used it brilliantly. What I wanted most to mention, though, is the film’s great contemporary jazz orchestra score by the legendary Don Ellis . I won’t even try to explain it, I lack the musical training and vocabulary, but the frenzied, jumpy score — packed with anxiety and a cacophony of urban noise — was the work of someone who, but for his early death, could easily have been a worthy successor to Bernard Hermann. When it came to almost bizarre time signatures, Ellis staked out almost completely idiosyncratic territory. He was 44 when he died in 1978.